U2 launched their latest album this week. ‘Songs of Innocence’ launched alongside Apple’s new iPhone 6. We all love a new Apple product in time for Christmas. As an added bonus, or not, your album is automatically listed on your iTunes account. No charge, how lovely! We all love a freebie. Don’t we? Apparently not, as one of the most read articles on BBC News today would suggest. The fourth most read article listed is ‘How to delete your free U2 album‘. ‘How to delete your free U2 album’ is all very useful and amusing but it lacks clarity. Even a tongue in cheek ‘How to’ guide must be clear, every technical author knows this. On a positive note, this article does have a reasonably high Flesch Reading Ease score of 75.6%. In addition, sentences are short and concise with an average of 12 words per sentence. The use of a screenshot to highlight the location of the ‘Delete’ option is excellent. The use of subheadings. This helps to point the user to their required area of the guide. The use of a numbered list of procedures. This helps to ensure that the user is working through the procedures in the correct order without missing any important steps. With these points in mind, I have rewritten the guide. Of course, it is not obligatory to delete your free U2 album. However, it is recommended. 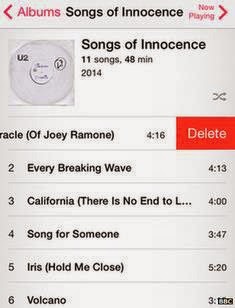 Use this guide if you want to remove U2’s ‘Songs of Innocence’ album from your iTunes account. 1. Sync your mobile device with your iTunes. As an iTunes user, you will already know how to do this. 2. Open the Music tab. The album is removed from your iTunes. 1. Open the Music app. You must delete each track in turn. 5. Repeat the delete process for all 12 tracks. There are 11 songs plus 1 booklet. The album is removed from your mobile device. ← Online Help! I don’t want to read a book!